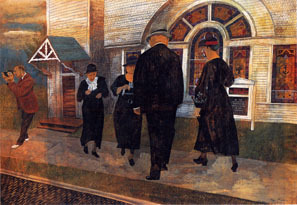 On a visit to Truro, on Cape Cod, in 1930, Shahn became dissatisfied with his prior work and training and began to paint what would later be known as some of the finest works of Social Realism. 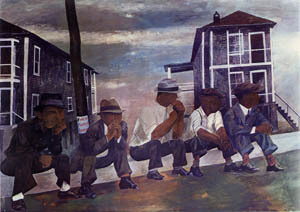 Shahn first became interested in scandals and social injustices, both contemporary and historical. 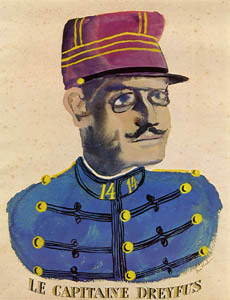 One of his first notable works was a series of thirteen paintings about the Dreyfus affair. Next, he did a series on the Sacco and Vanzetti trial. 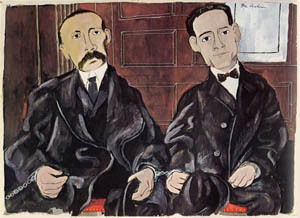 "Bartolomeo Vanzetti and Nicola Sacco". 1931-2. "The Passion of Sacco and Vanzetti". 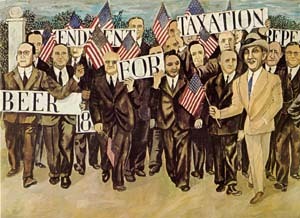 1931-2. 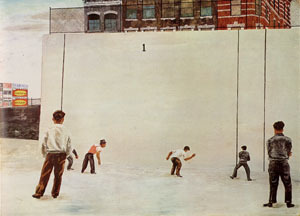 From 1933-34, Shahn was enrolled with the Public Works of Art project, for which he completed eight tempera paintings on the prohibition era. 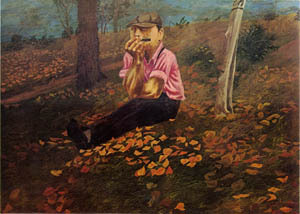 From 1935 to 1938, Shahn was employed by the Farm Security Administration. 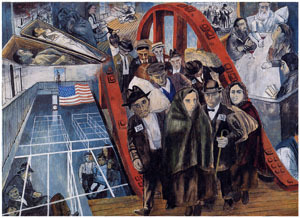 One of his projects was a large mural in a housing development for garment workers in Roosevelt, New Jersey. Study for New Jersey Homesteads Mural"
depicting people living in poverty both in urban and rural areas. "Myself among the churchgoers." 1939. "Pretty Girl Milking a Cow." 1940. 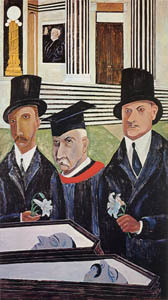 All biographical information from Ben Shahn, Voices and Visions, ed. Alma S. King, Santa Fe East Gallery, Santa Fe: 1981.